Hi there, how are you? I've been busy around here doing a little of this and a little of that, you know, the regular. I'm looking forward to starting the American Patchwork and Quilting sew along. 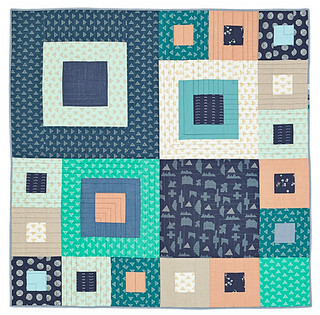 This quilt is from Quilts and More, and it's called Step by Step. These pictures are courtesy of American Patchwork and Quilting. This quilt is String Theory and it's from American Patchwork and Quilting. I haven't decided which quilt to make yet, there's alternate versions of both, and I'll decide when I get the APQ April magazine to decide which I'll do. This would be a perfect scrap busting project, maybe it's time to get out those scrap baskets. 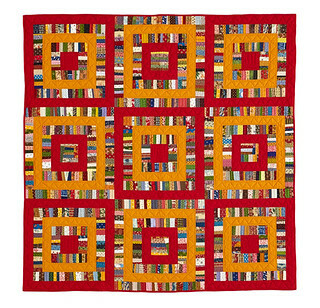 You can read more about others who are quilting along here. Hi Pam! It's been a tough news week so I had to start at least one new project, an open Heart quilt which I will show off on IG later today...well one block anyway! Your pink hearts are so sweet, mini or pillow? 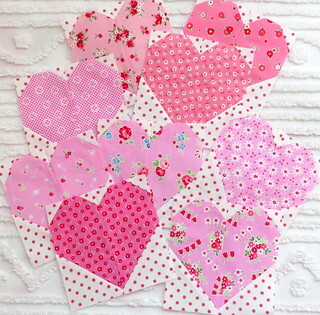 Gorgeous..... those fabrics make such sweet hearts! Happy weekend! Quite some time ago you mentioned the Miss Zukas murder mystery books. I took your advice and have one more to read in the series. They're wonderful reads and I'm so attached to our Miss Helma Zukas. I'll be sad to read the last book and was wondering if you could recommend another series. Thanks so very much. Janet have you read the Agatha Raisin series by M. C. Beaton? so fun! I'll look into the Agatha Raisin series. It sounds like just the ticket! I'll keep you posted. Thank you so much.